This document provides comprehensive requirements for handling security and privileges for Dataset processing. Admin Users: are automatically granted unlimited viewing and editing access to all Datasets, Dataset Views and Metrics and Reports created from them. Certain Privileges (at the User Editor): to be able to create new Datasets, Public Views, Create Content (Reports and Metrics) from them and grant access to Datasets to other Users and Groups. After a Power User is granted View Access to a Dataset, he gets access to ALL data in the Dataset, unless his access is restricted by a Apply a User Map to a Dataset. With Edit Access to a Dataset, a Power User sees all data even if the Dataset has a User Map. NOTE: Access to elements created from this Dataset is NOT granted automatically. Access to Reports and Metrics can be granted from the respective Report/Metric Editor > Advanced tab > Permissions or on the Group or individual User Editor. Privileges to review, use and create Datasets are not automatically granted in conjunction with other Permissions; for example, Edit Access to a specific Dataset. Create Public View: Dataset Views can be Private or Public. A Report and Metric can only be created from a Dataset's Public View. Allow Power Users to grant Dataset access to any User or Group: For this privilege to come into effect, a Power User should additionally be granted Edit Access to a specific Dataset. By default, a Power User without this Privilege can only grant Dataset access to members of Group(s) to which the Power User belongs. Click Save to confirm your intention to grand new Privileges to the Power User. The Add dataset Access to User pop-up opens. User: select the required Power and Regular user from the drop-down list. Power User can edit dataset: if you give a user a Permission to edit Dataset, he gets access to the Dataset's Data Source and an ability to grant access to this Dataset to other users or groups, based on related Privilege as described above. Click Save to to confirm your intention to grant new Permission to the Power User. Result: This user is going to be added to the list of users who have access to this Dataset. 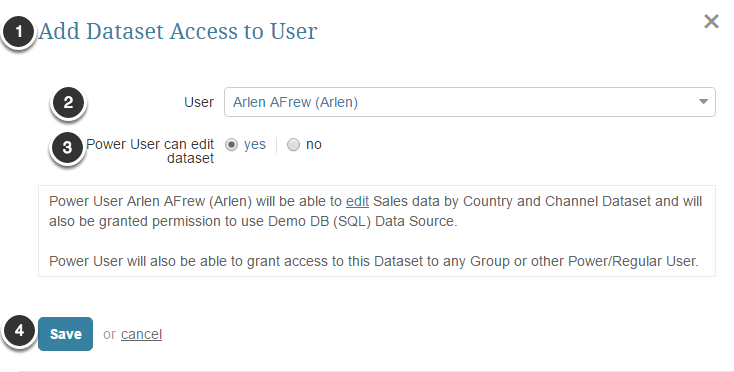 NOTE: Dataset access can be also granted from the User Editor > Datasets tab > [+ Dataset access to User]. Regular Users may only be granted View Access to a Dataset. They are not able to create any new Metric or Report. None of the Dataset Privileges are available to Regular Users. Group: select the group from the drop-down list. This option grants all Regular and Power users of this group access to data in the Dataset. Grant conditional edit permission to Power User members: if you set this field to 'yes', Power users from this Group will be able to edit this Dataset, get access to the Dataset's Data Source and an ability to grant access to this Dataset to other users or groups. Click Save to to confirm your intention to grant new Permission to the Power Users from this Group. Result: This Group is going to be added to the list of Groups which have access to this Dataset. 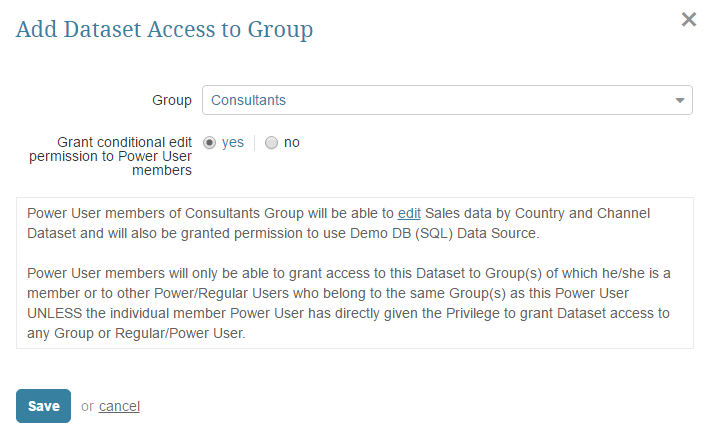 NOTE: Dataset access can be also granted from the Group Editor > Datasets tab > [+ Dataset access to Group]. If a Dataset is assigned to a specific Category, you may give view or edit access to Datasets included in this Category to Groups or individual users. In the example shown in the picture above the Dataset belongs to the 'Revenue' category; therefore, we may give users access to this Dataset via the Revenue Category. For more instructions, see the picture below. 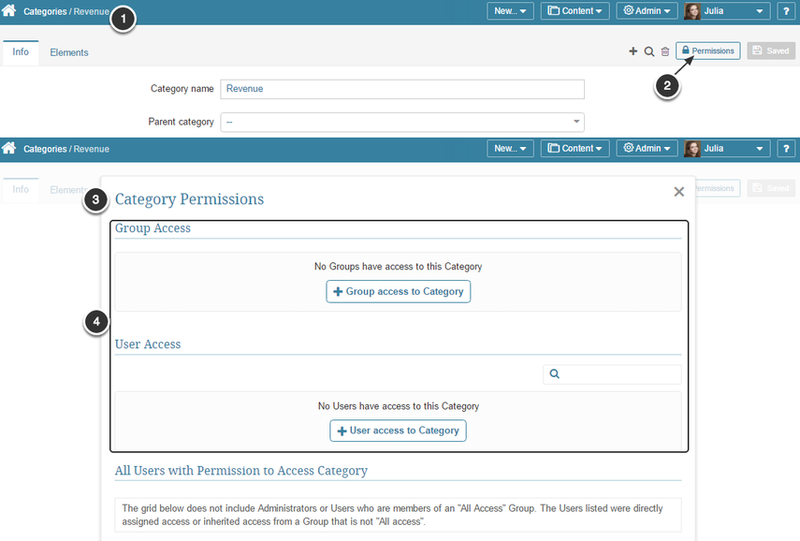 You can now grant access to specific Groups by clicking [+ Group access to Category]. This option grants all Regular and Power users of this group access to data in the Dataset. Power Users may get extra permissions, such as create Public Views and content from this Dataset if they have related Privileges. 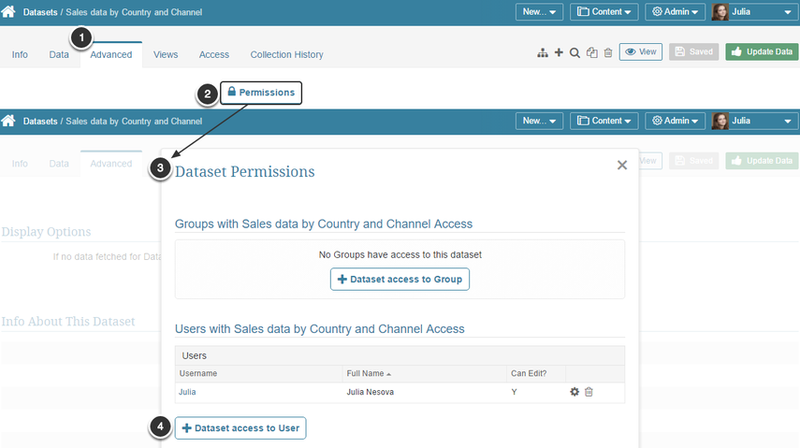 You can also grant Dataset Permissions to specific Users by clicking [+ User access to Category]. NOTE: Group member Power Users are not automatically granted access to the Data Source of Elements or Datasets in the Category. The Admin must specifically grant Permission to Use associated Data Sources to the Group or to individual Power User members.